On December 5, 2004 the vision the Lord gave to Pastor George M. Sharps surely came to pass. On this day after continued prayer, fasting, meditation on scriptures and seeking God’s face for direction, Jesus Lives Ministry Fellowship was founded. The ministry began worshipping at Tyler Heights Elementary School in Annapolis, Maryland. Pastor Sharps and his spiritual son Pastor Melvin Dickens expounded the Word of God with compassion and conviction. God added to the body of Christ at Tyler Heights Elementary School and therefore, a new sanctuary was needed. Jesus Lives Ministry Fellowship believed and trusted God for a place to worship without time restrictions. 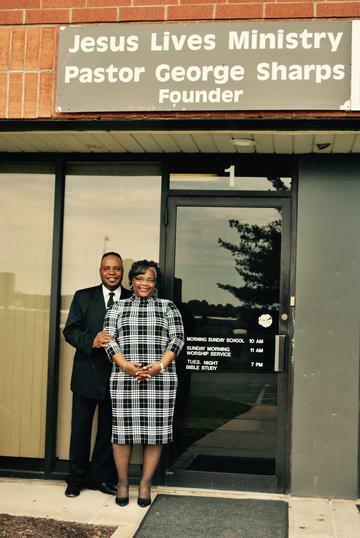 Pastor Sharps’ heart is for Kingdom building, he desires to see the people of God prosper in all areas of their lives. Faith is the foundation of Jesus Lives Ministry Fellowship. Within a year of fellowshipping at Tyler Heights Elementary School, God answered the prayers of His people. In November of 2005, the ministry moved from Tyler Heights Elementary School to its very own building in Hanover, Maryland. This move was a blessing and testimony of God’s faithfulness. God allowed souls to be saved and many lives to be restored to the joy of His salvation. Yes, the ministry outgrew this sanctuary and in order to accommodate the people of God, in May 2008, God blessed the ministry to move to its current location at 7466 New Ridge Road Suite 1 Hanover, MD 21076. We serve a living God! For such a time as this, God has blessed this Fellowship tremendously. Within the body of Christ at Jesus Lives Ministry are Elders, Ministers, Evangelists, Deacons and Laborers in the Lord, as well as active ministries. With God on our side this ministry continues to be a blessing within our community. Jesus Lives Ministry Fellowship is a dynamic ministry founded on faith. We are a non-denominational house of worship and prayer. Pastor Sharps is a humble and devoted Shepherd who loves to teach the Word of God wherever he goes. He and Sister LaTandria encourages and reminds the body of Christ of how much they are appreciated in their service to God and reaching out to people from all walks of life. Eyes have not seen, neither ears heard what great things are in store for Jesus Lives Ministry Fellowship. Our best is yet to come! To God be the glory!